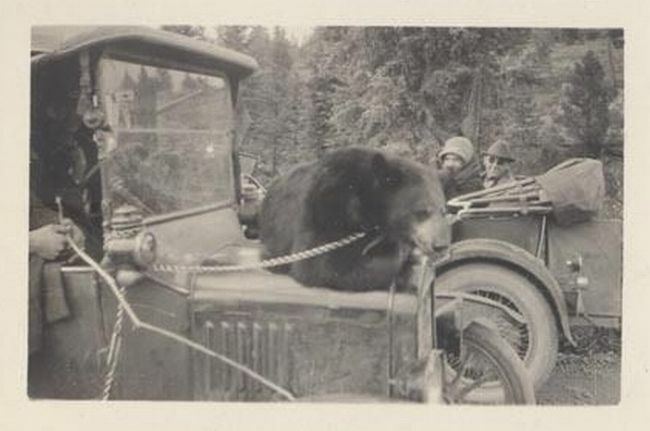 Whats wild is that bear looks to be on a chain leash hooked to the gas lamp. The best part is the wood stick in the passengers hand. A nice warm place to have a nap while riding to grandma's house. I wonder what a State Highway Patrol "Smokey" would have to say about this method of transport for the family pet who has out-grown the child safety seat? I think that same hood is on my wife's Touring. I always wondered what happened to it.